We are still very much in the throws of cold, snowy/icy/wet winter weather, and I don’t mean to get too ahead of myself because I know March always feels like the coldest month to me here in New Hampshire (ready for spring and chomping at the bit, but the landscape is still very much frozen over), but there are little signs of spring beginning to pop up here and there. A couple weeks ago, we had an unseasonably warm day of almost 60 degrees and the daffodil shoots were already trying to make an appearance at L’s preschool (since then of course, it’s been back to snow and ice). And our baby chicks from last year have started laying some eggs which is exciting! Speaking of the chickens, it’s pretty amazing how genetics work. We have always had a mixed flock of cold hearty birds, and our first birds born on the homestead have a father Araucana (our “Roo”) and the mother for all three must have been one (or several) of our Buff Brahmas since a couple of them have the feathery feet and general body shape of the Brahma’s. The third is slightly more body shaped like the Araucana but they all still look very similar and strangely all have the coloring of Light Brahma chickens even though we don’t have that breed. The Broody hen that hatched them was a Buff Orphington and so far they have all been laying green eggs. It’s such a treat to see the wild birds at the feeders again too! Not that they shouldn’t have been here more but we had a problem in the late fall with flying squirrels getting into our home (yikes!) so while we were sorting that out we didn’t start out with our feeders up so the birds obviously went elsewhere and when we finally put them up in January, it took weeks for the birds to find them. But anyways, they are back and I love to watch them while working in the kitchen. Pretty soon, it will be time to tap our trees and have a few syrup boiling days! Last year we invested in an old oil drum set up to boil syrup outdoors and only got around to having one boiling day. Hopefully we’ll have a couple more this year as it’s always a nice excuse to get outdoors in the last of the wintry weather before everything turns to mud. Well since my last update nearly two (gulp! appears to be my current rate of posting..) years ago, there’s been a few things happening around the homestead. Much of the reason for the lack of updates is we had baby #2 about 11 months ago. So in my usual fashion, was more focused on other things than keeping up with the homestead while I cooked another baby and recovered from child birth. Because this ‘blog’ is really just an online journal of the happenings in our home, it’s important to mention that we were thrown a bit of a loop this year as well when a few months ago I was diagnosed with melanoma and had to undergo a lot of testing and surgery. Luckily the prognosis is good, but am still working on healing both physically and emotionally. In news around the homestead since out last update, we actually havent gotten any new chicks since the last order in 2015. We have meant to a couple times but with one thing or another we never got around to it. And the girls (and one rooster that came out of the last batch) have had a happy healthy life running around outside, scratching up our yard and eating bugs. We had lots a few to old age /illness / predators but overall things were pretty good. And we had the exciting surprise this year that one of our hens actually hatched a few eggs so we had 3 new homegrown baby chicks (who so far all appear to be female… is it possible…?!). But luck doesn’t always go on forever and one day a month or so ago when I was at the Dr’s to get some stitches out, there was a snowstorm and a fox attack wiped out almost out entire flock of chickens… the only ones to survive were (surprisingly) the babies that hatched this summer and the rooster “Roo” (side note, Pru passed away just over a year ago of natural causes and our young rooster who was accidentally a boy from our shipment has been wonderful. Never people aggressive at all and pretty mild mannered… of course all his ladies were slaughtered by the fox while he survived so pluses and minuses I suppose). We plan on definitely ordering a new batch of chickens this spring so hopefully we can sell some eggs again in 2020. As far as the beehives go, we haven’t started that back up yet but plan to in the future when the children are a little bit older. As far as the garden goes, it’s been coming along nicely! I was fairly useless last year (but had expected I wouldn’t get anything done post baby so no surprise there) but Joe worked really hard and really kept things going and made an irrigation system and long rows for our vegetable garden (with a row of flowers for me to have a cutting garden). So things are coming along and we’re already in the planning stages for our garden this upcoming year. In addition to my row for the cutting garden I am also hoping to help revive some of the neglected beds I’ve made around the yard and generally try to care more for things already planted around the yard. I think we will be able to take out first small harvest from out asparagus beds this year (year 3) and last summer we finally were treating to several peaches from the fruit trees we planted 5 years ago. Still no apples or pears, but maybe this year. As far as sewing and knitting goes, I have been fairly active since the last post and made and learned a lot of new things (aside from the slow pace of things post baby) particularly with sewing. But I’ve decided to just write about that side of things on a separate blog I’ve started with my friend Betsy. In any case, sorry for the incoherent ramblings but just wanted to throw something of an update there to get this up and running again. Long overdue updates that is! In the two years (ahem!) since we last posted, there have been lots of changes around NOBO homestead. My grand garden plans for 2015 fell very short because other developments popped up and took our attentions elsewhere over the summer. Namely I spent the summer cooking this little dish which left my energy a bit zapped. As a brief update, we did expand our chicken flock in 2015, with 9 new laying hens (8 as one turned out to be a rooster) and an experiment of 4 meat birds that went well (if a bit of an emotional learning curve). In the late summer of 2015 a hungry bear also found our beehive when we had the electric fence turned off for mowing (rats!). Joe bravely tried to put back the remains of the hive but it was too late in the season and too much damage for them to make it through our New England winter. The bees also weren’t very appreciative of Joe’s heroic efforts! Somehow he got through it and even managed to build this beautiful woodshed before the snow flew. We did get a decent vegetable garden going in 2016 thanks to Joe who did the bulk of the work both with the garden and the chickens. And now that our baby is more mobile, we’re hoping to both spend a lot more time out there this year. Especially as we are both really enthusiastic about gardening. ‘Big plans’, as Joe says. 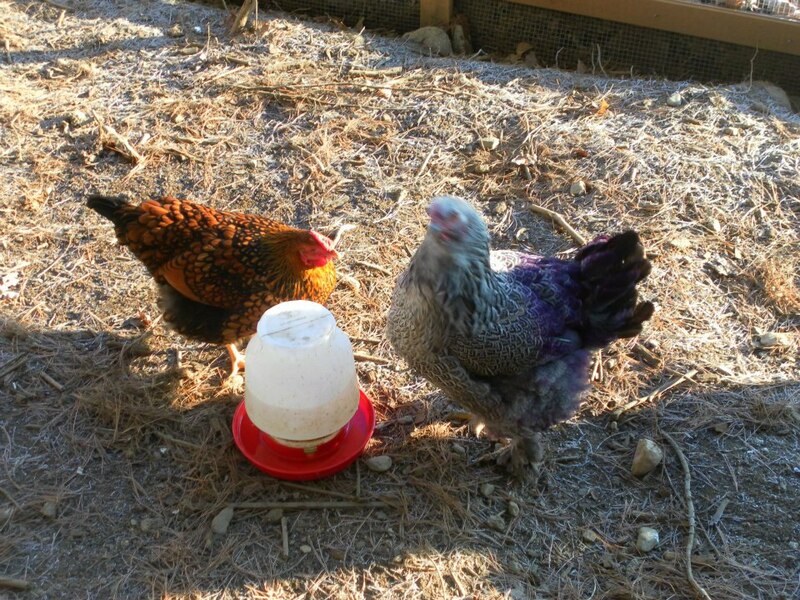 We will probably add a few more new chickens to add some younger birds to our flock. If anyone is wondering, our rescue rooster from a few years back is still going strong! Though he is a bit temperamental with me, so Joe mostly deals with him. The newer rooster is a lot more chilled out. And we still are lucky enough have one of our original ladies (Bobby Sixkiller) with the flock. 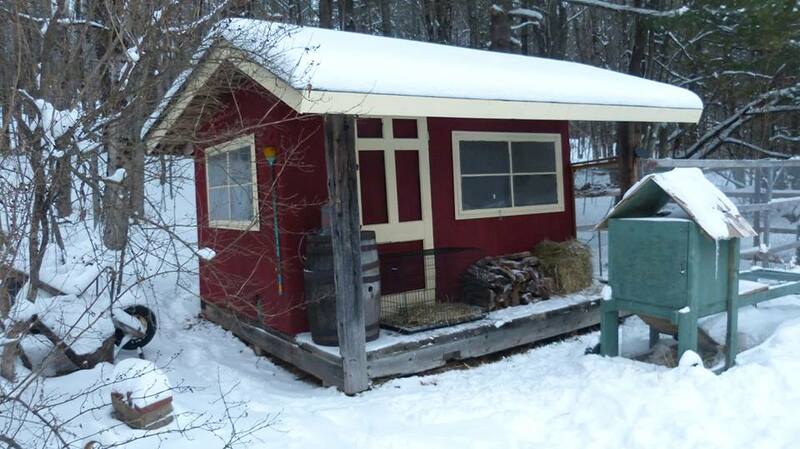 In other 2016 homestead news, Joe also built this beauty for drying diapers and laundry in the sunshine out back! And an epic garden fence, with room to grow, in order to keep the chickens/critters out of the garden (lesson learned 2015) since we let them free range all day now. That’s most of the updates for now. The moral of the story is that Joe has taken on a bulk of the homesteading duties while we’ve adjusted to life with the little one so hopefully I’ll make more of a contribution this year! At the end of 2016, I dusted off my sewing machine that I had intended to learn garment making on a few years back, and was suddenly inspired to pick it up and start learning. I’ve made a few clothes and a Christmas quilt for the little one and some gifts for friends/family. Now onto attempting to make some grown up clothes for yours truly. First completed attempt: Margot Pajama bottoms from the book ‘Love at First Stitch’. I’m pretty please with how they can out and they sure are cozy. (Please ignore the messy hair and dark lighting- still getting used to this smart phone thing) Feels good to be creative again after a bit of a break! Well that’s all for now. Will try to update this more as they year goes on so when we look back we can see that we actually DID accomplish more than we remember! Yes, we are still underneath about 4 feet of snow with sub zero temperatures outside and trying to keep positive thoughts that the part of our roof we weren’t able to clear remains strong and steady under the massive pile of snow and ice that has accumulated. And yes, we did spend a good portion of last week with hair dryers to pipes trying to thaw out our frozen heating pipes. But it’s nearly March, and since the temperatures are still too cold to tap our maple trees, I’m celebrating the upcoming thaw (I hope!) by planting our first seeds indoors for the garden this year- some onions, leeks and celery. My little seeds of hope that this frigid weather will come to a close at some point! While I haven’t done the best job at keeping notes on the garden in the past, I’m really going to make an effort to use this space to keep track of our progress with projects as we attempt to grow our gardens and edible landscape around the house this year. We did pretty well last year even though we are still expanding our growing area and my eyes are often bigger than my stomach, so to speak, so I am rarely (never) able to accomplish all I dream up in my head. 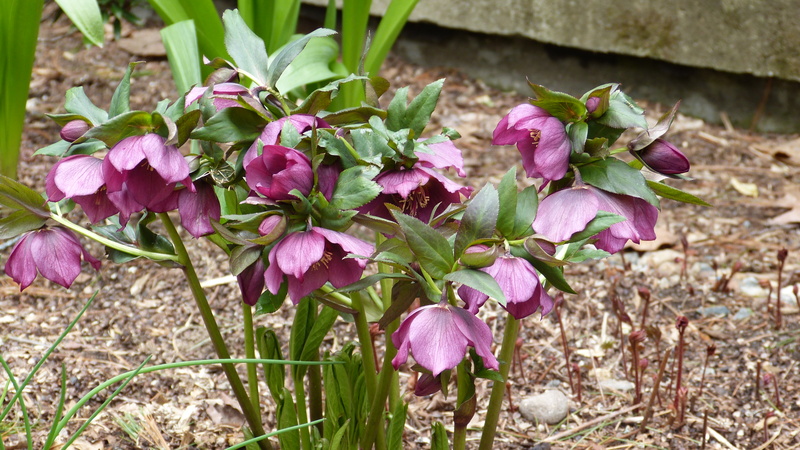 In any case, here a photo from warmer times looking at one of the first flowers to pop up in our front garden here- the hellebore. It didn’t peak it’s head up until late April last year so I’m expecting similar timing this year. Just 2 months to go! How quickly things change. A couple days after writing that last post, I was feeling pretty happy in our adventures in keeping chickens. Their coop has been much improved since last year with a new roof and coat of paint, we seemed to be doing a better job with the deep litter method and all then hens appeared happy and laying. We had even come through the few VERY cold days (-20 F anyone?!) after the new year and temps were beginning to warm up. So imagine my surprise, when Joe and I opened the coop up on a sunny Sunday morning to find our rooster, Pru, a little out of sorts. He’d been getting bits of frostbite on his comb/waddles from the cold but we’d been occasionally putting Bag Balm on to try and help curb it. But this morning, we took one look at his waddles which were massively swollen and knew something was very, very wrong. I said to Joe, “This can’t be normal! He looks like the elephant man!” so we immediately brought him indoors and set him up in a crate in our basement to warm up. Long story short, his condition went from bad to worse. The swelling hadn’t really improved, he was just sleeping on his face the whole time and was very off balance and not able to stand up. We were attempting to spoon feed him anything he would take every few hours (mushed up food mixed with water, yogurt, water) but he wasn’t really taking much in. By Monday, his breathing was labored, his ears were almost purple and SO swollen they looked like they might pop, and he was barely opening his eyes. Obviously rest wasn’t doing the trick and this was becoming a matter of life and death for him so I called our (dog) vet to see if they had any ideas for us. As it turns out, there is an avian vet in the office and he would be in on Tuesday so we dropped Pru off first thing in the morning and waited for our appointment later that afternoon. With some antibiotics, steroids and about a 5 second tutorial on how to IV hydrate and tube feed a chicken we brought Pru home later Tuesday afternoon. Joe and I had a big learning curve on taking care of a sick bird and forcing food and water into him (I was so nervous about putting the tube down the wrong way! ), but we managed it in the end. His condition did finally begin to improve after a couple of days of care and when I heard him attempting a stifled crow one afternoon, things were looking up. I’ve never been so happy to hear that sound (though I always enjoy the sound of crowing regardless). So our little guy has made a great recovery in the couple weeks since all this drama unfurled and we’re sure he’s looking forward to getting out of the basement and back with his ladies. If only this polar vortex would shift away and spring arrive! I guess the lesson here is never to get too comfortable, the next challenge is just around the corner! Happy New Year! Well the new year has certainly kicked off with frigid temperatures and snow! Winter is a particularly tough time of year to take care of chickens. Nevermind dealing with snow wind and below freezing temperatures, as I remember last year with the 3 girls, there were bouts of boredom and feather pecking as well. Attempting to deal with the plucking was brutal and didn’t really stop until we finally separated the culprit- Reno Raines. Reno is still separated from the flock (and as a note she doesn’t appear to mind in the least) as she started picking a fight with the new rooster (through a fence I might add). And since everyone else was getting along so well already, it just made sense. It’s hard to write Reno off completely though- she not aggressive towards people (though skittish) and for some reason she has never stopped laying eggs since she started last fall- even through winter and a molt. So separated from the others and in the comfort of her own enclosure she remains. And speaking of winter and egg laying, something slightly strange has happened recently. I don’t supplement light or heat for my chickens as I figure it is better for them to go through a cycle of not laying during the winter if that’s what happens naturally. But then beginning in December, our new Orphington started laying. Then shortly after Bobby Sixkiller has started laying as well (note- she did not lay at all last winter). I thought it was a strange coincidence that these two chickens are the only two I’ve actually seen our new rooster (Pru) trying to mate with. And sure enough, in the last week we’ve started getting some green eggs from our little Ameraucauna as well. 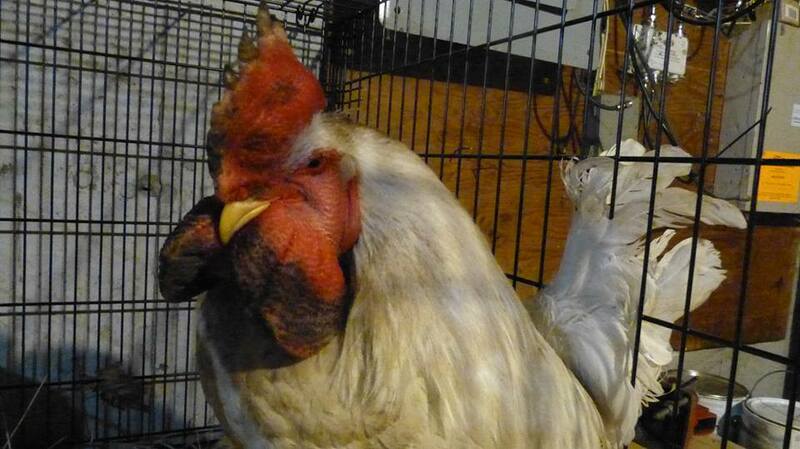 Since we now have at least 4 hens laying during the coldest and darkest part of the year, it makes me wonder- does having a rooster around increase egg production in the winter months? In the meantime, we’re happy to have our omelets in this cold weather! Life is full of lessons learned- some good and some not so good. Some lessons help you to move forward, change direction or stop you in your tracks and re-evaluate why you are doing something. One lesson I’ve learned about myself is that I’m pretty crap with this blogging business – inconsistent with my writing (hello random post a year ago! ), terrified of a blank page and generally not sure why I’m doing this in the first place. Looking back as to why I created this website, I wanted to document all the fun events and changes that are happening at this point in life for personal reasons. Lord knows I’m not organized enough to keep a written diary (after dozens of abandoned attempts!). And although I have not followed through with writing about all the changes that have taken place these last couple years, the changes they are a-happening! I’ve really enjoyed looking back over the meager entries I’ve written in the past and realized how much has changed since then. So I’m freshly inspired to really dedicate more of an effort to this online journal. There have been several new additions to the homestead over the years that I haven’t written about – new chickens, new hive a bees, a husband, our dog Rosey and most recently (as in yesterday!!) 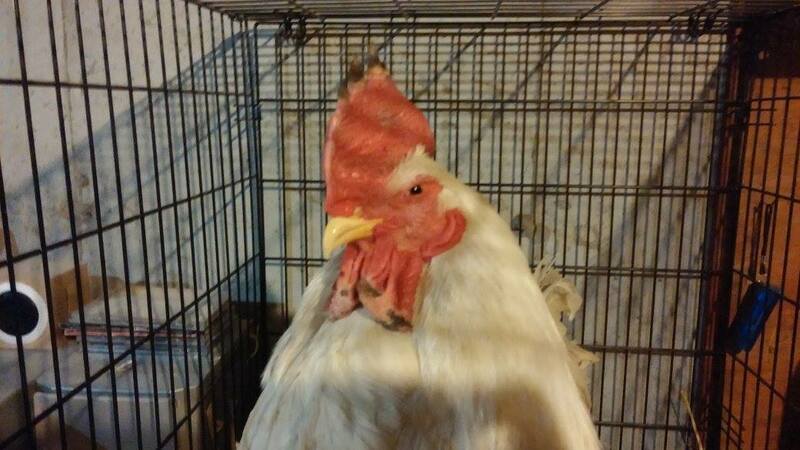 an adopted rooster. Since the intention of this space is to chronicle our day-to-day adventures (and no one aside from my husband knows of the website’s existence- Hi Joe! ), I think over the next few posts I’ll provide some introductions of the critters and places of the NOBO homestead. After all, where have my manners been? 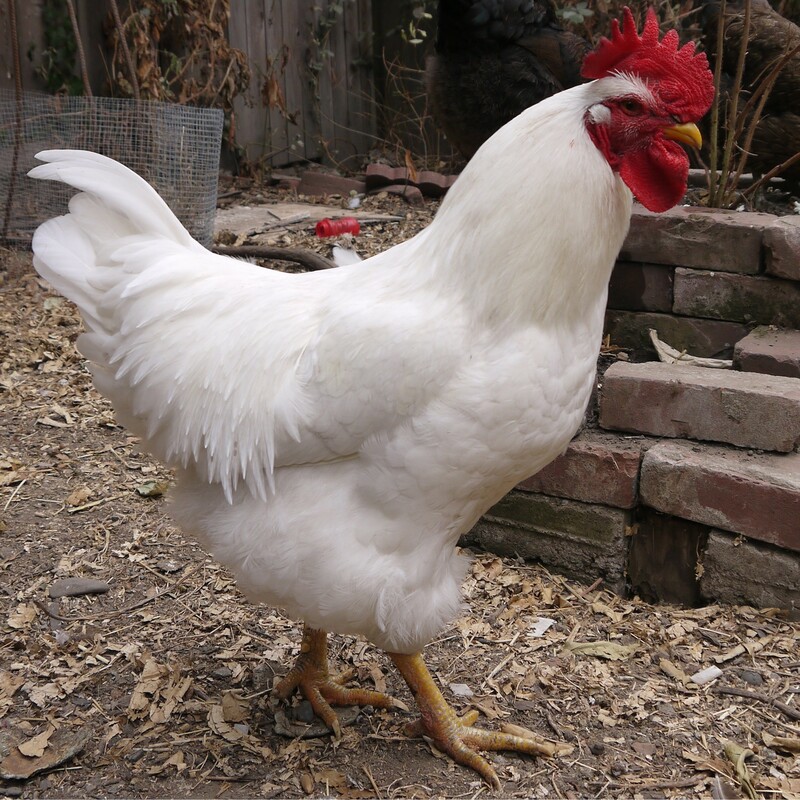 In the meantime, enjoy a photo of our stunning new rooster Pru (or Bradley Cooper as he’s more affectionately called). This is our first time with a rooster so it is sure to be an adventure indeed!